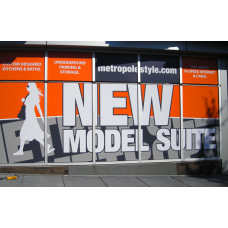 We offer three different types of custom window signs that can be mounted to the inside of your store front or vehicle windows to promote your business. They can be used to advertise your products and services, or they can just have your company's information on them. Inside mounted window signs are very popular because they are less likely to be take down or damaged by other people walking by your store or vehicle. You may want to consider using a vinyl banner if you need a temporary indoor window sign for your business that can be changed out or taken down frequently. You can simply attach the banner to the store front window with suction cups inserted through the grommets in the banner. 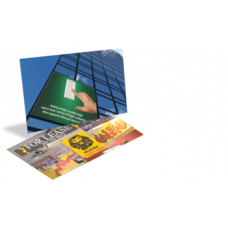 Vinyl banners are a good choice for window signs because they are very durable, UV resistant, and are easy to roll up and store when not in use. The different quality levels of vinyl banners we offer can be seen on our vinyl banners page or in the table shown below. 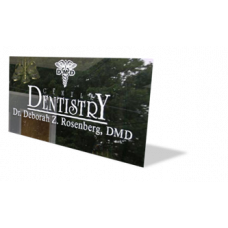 If you are looking for a more permanent or higher-end indoor window sign, our reverse-printed adhesive back vinyl window signs are a good option. These are produced by reverse printing on a clear adhesive backed vinyl, so the adhesive is on the face of the sign. Because solvent inks are semi-transparent, we then back the sign with a layer of white adhesive-back vinyl to ensure your text and graphics stand out. This clear layer and white backing also adds a level of depth to your design as well. To apply, you simply remove the masking from the face of the window sign, and then apply the face of the sign to your window, facing out. Static clings signs make great window signs, as they use static electricity to adhere to the inside of windows. They are very easy to put up and take down. Our static cling window signs are priced in the table below. For more information on our static cling signs, you can also visit our static cling sign page. Our window signs are cut down to size for no additional fee. Grommets can be inserted into the banner style window signs for free as well. No additional finishing is required in most cases. If you have any questions, please contact one our account executives for help. We will ship your window sign order in 3 business days from the time we receive your order and final print-ready design files, or proof approval if we are creating the design. Faster turn-around is available if needed, but rush fees may apply. Several shipping options from Ground to Priority Overnight are available to ensure your signs arrive on or before your due date. Contact us if you have any questions. If you are ready to order your inside mount window signs, please contact one of our account specialists today! We offer three different types of custom window signs that can be mounted to the inside of your stor..
Our outside mounted window signs are designed to be applied to the outside of your store front or v..
Our static cling signs are easy to apply and remove, so they are great for displaying promotions and..